Did you know that the first business cards appeared in the 17th century? Only aristocratic “celebrities” had them until they grew in popularity as calling cards for home visits. That popularity is just as strong in modern times, though obviously more for professional use. Even with a surge in e-commerce where business identities are formed by web presence and social media, the business card still holds a solid place as a form of professional representation and recognition. Think about it from a consumer standpoint and everyday face-to-face transactions. The mechanic, hair stylist, accountant, doctor, bank representative, real estate agent, furniture showroom salesperson…no wonder 10 billion business cards are printed annually in the US alone! That’s according to http://www.statisticbrain.com, which also points out that company sales increase by 2.5% for every 2,000 cards passed out. Quite a return on a relatively small investment when you think about it. How do you make your card stand out? Technology offers unlimited creative designs with colors, graphics, and text fonts that make even traditional horizontal rectangular business cards eye-catching. Going off the grid with unique shapes also separates your card from the competition…say, in an oval. Or go taller with an increasingly popular vertical card design. You also want to complement your artistic business card masterpiece with the proper showcase: Business Card Holders designed to enhance your name. The Acrylic Business Card Holder has been a staple product of Plastic Products Mfg (PPM) for decades and styles have grown over the years to accommodate both classic and more avant-garde approaches. Counter Top Single Pocket High Back and Vertical Card Holders make ideal showcases for those unique business card shapes and styles. A Vertical Card Display definitely stands out on your desk and/or counter. There’s also a Glass Green Card Display that lends a classy touch to the décor. Multi-Tiered Business Card Holders also combine function with stand-out design and stair step styling in clear or black acrylic. Multi-Pocket Business Card Holders deliver a spotlight of maximum exposure on a complete department or sales force, especially in high foot traffic areas and busy office centers as well as car dealerships. Wall Mount Business Card Holders with a central Sign Holder design can also be put to effective use at eye level in those same high traffic spots. Of course, the largest concentration of personal business card transactions takes place at trade shows and kiosks. Both are perfect venues for two different Business Card Holder approaches. First, the basic Single Pocket Card Holders…able to take the hardest knocks and they travel well without taking much space. You can also make Single Card Holders stand out in black. Then there’s the Combination Sign/Business Card Holder, a proven effective vehicle for halting foot traffic with a Top, Side, or Center Sign Holder, surrounded by six or eight pockets. Imagine the possibilities with gift cards in those pockets, and the promotion itself prominently displayed in the Sign Holder. The advantages of Sign Holders with Business Card Holders are as clear as acrylic and shows how it can be used even beyond the business card. No matter which way you go, it’s obvious the business card is not going out of style anytime soon. Neither is the Business Card Holder that helps make it – and you – prosper. The possibilities shown here are just the beginning and you can find even more inspiration at www.plasticproductsmfg.com. Show your name in the best possible light with the experts in Business Card Holders at PPM! It’s anticipated that some 10,000 trade professionals from around the world will converge on the Jacob K. Javits Convention Center in NYC February 3rd through 6th for 2019’s National Stationery Show. More than 400 companies will be exhibiting, ranging from card and gift shops, party stores, and big box retailers to importers and special event planners. In the spirit of competition, creativity at NSS can also be rewarding. The 3rd Annual “Design Our Valentines” contest could not be timed better. The highest honor however is the Best New Product display in multiple categories…like All Things Wedding (Invitation Suites, Bachelor/Bachelorette Party Gifts, Favors, etc. ), Cause-Related products, All Things Paper, and Life/Style (candles, soaps, pillows). These are just a few. As the year’s largest industry show, NSS calls itself “The Home for New Stationery Trends.” It’s the time and place for those “emerging designers” to show their flair alongside familiar, well-known brands. And when it comes to print displays, we’re setting a few new trends for 2019 ourselves. 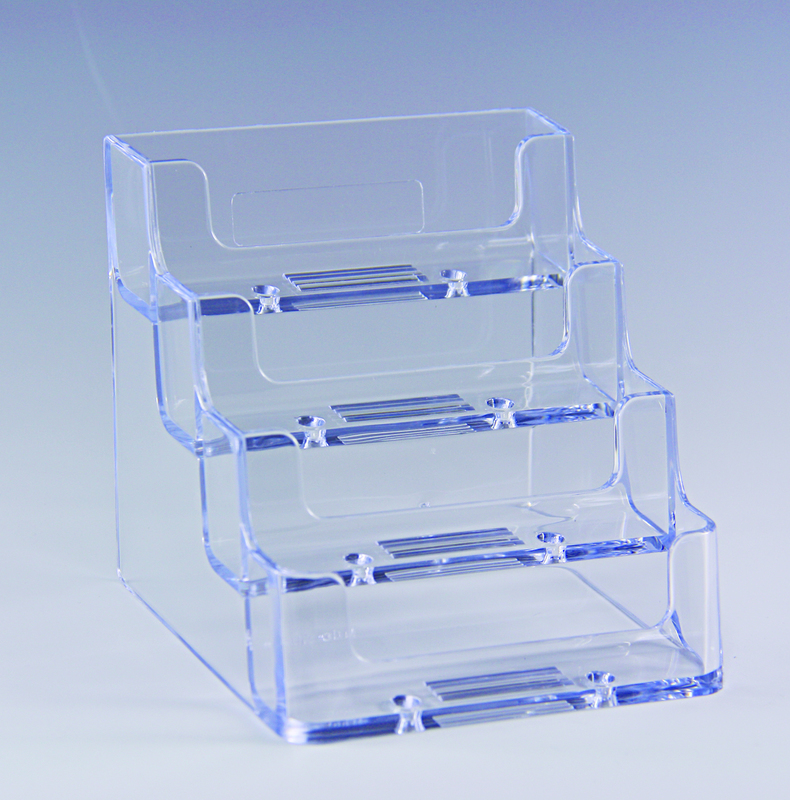 Clear Acrylic Brochure Holders from Glass Green to the Elite Series provide a classy complement to superb print products. Crystal Clear Sign Holders increase visibility, making a fine vehicle for retail promotions including the specific niche businesses NSS attracts. Even name plate displays are getting a bold new look in print, beyond the ubiquitous black-and-white. In keeping with NSS creative inspiration, Name Plate Holders with pattern alternatives, colored borders, and free card stock options are the cutting edge of a new trend on a traditional display. Give it some thought…standing out with customer appeal takes more ingenuity than ever now and the “same old” approach can leave eyes glazed instead of engaged!